In America, when we think of a National Park, we envision Yosemite, Yellowstone, Grand Canyon, or maybe the Everglades. Big skies, expansive landscapes, spectacular views, open spaces, clean water, clean water, quiet sounds, trails, and solitude. But National Parks in other countries are not necessarily like our National Parks in America. My National Park hiking companion and I took a day to visit one of Taiwan’s National Parks. Taijiang National Park in Tainan. It is a young park and was established in 2009. We knew to not expect what we have back home, and we found a unique park experience. An early bus took us several stops to the National Park Headquarters. A large temple greeted us, and we needed a few minutes to decipher where was the Park? Not much of the map is translated into English. Our homework taught us about the “Green Tunnel Tour” through the mangroves, showing the local aquatic plants and animals. Crabs, birds, butterflies and assorted plantlike were the focus of the boat ride. We bought our tickets for the Green Tunnel Tour and for about an hour we were inflicted with constant and consistent narration. We didn’t understand a word. It was clear that we needed to duck a few times to avoid getting struck by a mangrove branch, but otherwise, it was incomprehensible and annoying. Picture the jungle ride in Disneyland with loud Chinese narration, trash in the water, but no alligator. I love mangrove areas, but I’m not sure this ride was a good representation of a mangrove ecosystem. The tour did have a moment or two where the mangroves were reaching to meet one another. Piles of clam and oyster shells, holding ponds for aquaculture, an old man fishing over the bank, small huts, planted fruit trees, and guard dogs greeted us in the quiet of the wetlands. Here was working water. People living their lives in their environment. We found a sign that showed that the road we were walking was the border between the National Park and agriculture. After our walk, we went for lunch at a nearby food court. Some of he worst food I have eaten while traveling was at an American National Park (Ok, Kings Canyon National Park.) So we have low expectations, even in Taiwan. There were no english menus, so we got help. “Specialty, egg and oyster and vegetables.” Sounded harmless. The omelet was cooked with bean sprouts and the strangest gooey partially fried starchy blob, all covered in some kind of gravel. It truly challenged my texture gag reflex. We agreed that it was one of the strangest foods we have ever eaten. We ate it, but it was strange. Sometimes I think we don’t know when to quit. 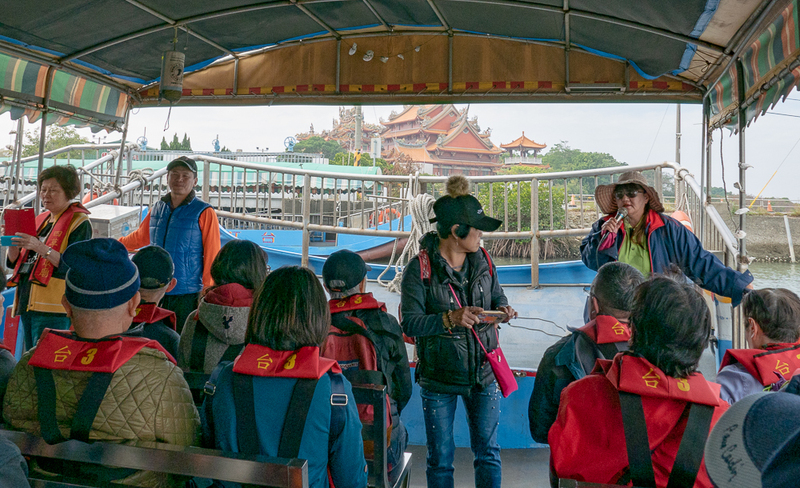 We bought two more tickets for a second tour on a larger boat out into the more open waterway. This one had a very loud speaker and a tour guide that, I swear, did not take a breath the whole time. I guess we didn’t learn our lesson the first time. On the ride, we saw dogs on a beach, men fishing, several hotels, a grey heron, overcast skies, and non-stop Chinese narration. By the end of the ride, our ears were ringing, and we were tired. Not a mangrove leaf, but an interesting leaf. The tours were annoying, but I found it encouraging that these boat rides were popular. There was a long line for the Green Tunnel and a large crowd on the open water boat. People liked them. There was something about being in the wetlands, and on the water that attracted people. It wasn’t a shopping mall, or a museum, or a sports event. It was just a place where people were living next to wetlands, and people liked it. If a park connects people with the environment, it is a good thing. If it takes a dramatic landscape or a constant narration, it is the relationship with the environment that makes an area worthy of the title National Park.